What Is The Generic Name For Osteofos 70 Mg? Which US Brand is Equivalent To Osteofos 70 mg (Sodium Alendronate)? Osteofos 70 mg tablet is having an active molecule, Sodium Alendronate, a bisphosphonate is used to treat the Osteoporosis and widely available at all the drugstores, leading online pharmacy stores, and medical supply stores and can be given by doctor’s prescription only. 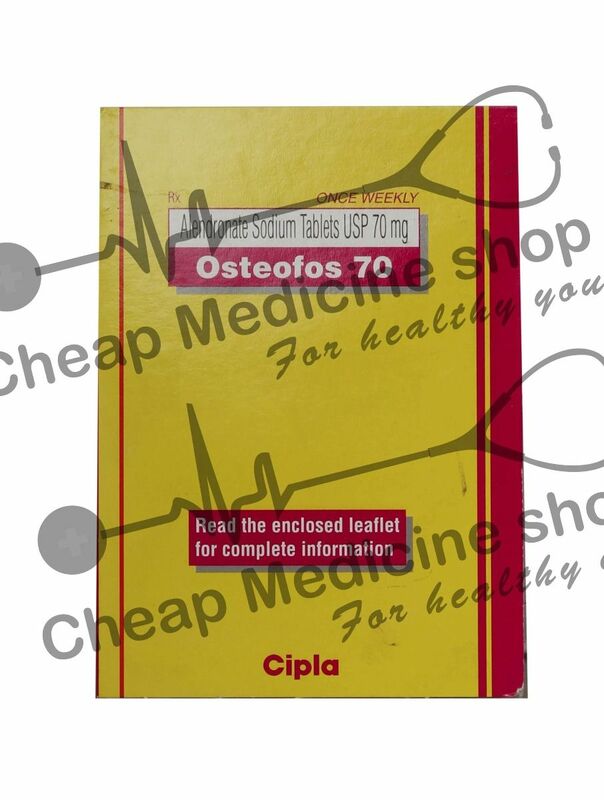 Cipla (India) is one of theleading pharmaceutical companies which manufacture Osteofos 70 mg.
Osteofos 70 mg containing Sodium Alendronate, 70 mg per tablet is available in the various strengths and substitutes at all the leading pharmacy, drugstores, and medical supply stores. What Are The Uses Of The Osteofos 70 Mg (Sodium Alendronate)? How Osteofos 70 Mg (Sodium Alendronate) Works? A bisphosphonate molecule, Sodium Alendronate in Osteofos tablet basically works by suppressing the activity of osteoclasts cells that cause the destruction of bone, thereby strengthening the bones and minimizing the risk of fractures. What Should You Avoid While Taking Osteofos 70 Mg (Sodium Alendronate)? When Not To Use Osteofos 70 Mg (Sodium Alendronate)? Experience Pain in Jaw, Throat, Chest, Abdomen, Hips or Thighs. Osteofos 70 mg contains Sodium Alendronate, which is used in the treatment of Osteoporosis and available in various strengths and substitutes and should be given on prescription only. Osteofos 70 mg is well tolerated medicine and provides relief for a longer time but you should always consult your doctor for duration of dosage as age and severity of the disease differ from person to person. Adults are advised to take Osteofos 70 mg at a fixed time probably in the morning time on an empty stomach followed by no eating or drinking for 30 min. Do not consume larger or smaller amounts than Prescribed. How Much Of The Osteofos 70 mg (Sodium Alendronate) to Be Used? Patients are always advised to follow their doctor’s prescriptions and instructions to take Osteofos 70 mg. It is advisable to take Calcium and Magnesium Supplements while taking this medicine. How To Take The Osteofos 70 mg (Sodium Alendronate)? Osteofos 70 mg dose should be taken in morning on an empty stomach. You must swallow the tablet as a whole with water. Do not chew or crush it. For How Long Should You Continue Using Osteofos 70 mg (Sodium Alendronate)? You are always advised to take Osteofos 70 mg as prescribed by your doctor. You are not advised to take it in larger amount or for a longer time than recommended. Contact your doctor immediately if you suspect an Overdose. A missed dose of Osteofos 70 mg should be taken as soon as you remember. Just skip the dose if it is the time for the next dose. Do not double the dose for next time if you missed once. What Are The Side Effects Of The Osteofos 70 mg (Sodium Alendronate)? Always consult your doctor to get best possible treatment and dosage adjustment in the above conditions. Store the Osteofos 70 mg at room temperature in dark and dry place. Make sure the strip of the tablets should be intact and not damaged.